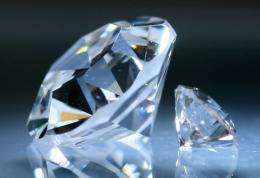 How do diamonds the size of potatoes shoot up at 40 miles per hour from their birthplace 100 miles below Earth's surface? Does a secret realm of life exist inside the Earth? Is there more oil and natural gas than anyone dreams, with oil forming not from the remains of ancient fossilized plants and animals near the surface, but naturally deep, deep down there? Can the greenhouse gas, carbon dioxide, be transformed into a pure solid mineral? Those are among the mysteries being tackled in a real-life version of the science fiction classic, A Journey to the Center of the Earth, that was among the topics of a presentation here today at the 242nd National Meeting & Exposition of the American Chemical Society (ACS). Russell Hemley, Ph.D., said that hundreds of scientists will work together on an international project, called the Deep Carbon Observatory (DCO), to probe the chemical element that's in the news more often than perhaps any other. That's carbon as in carbon dioxide. "Concerns about climate change have made millions of people aware of carbon's role on the surface of the Earth, in the atmosphere and in the oceans," Hemley said. "The Deep Carbon Observatory will uncover critical information about the movement and fate of carbon hundreds and thousands of miles below Earth's surface. We call that the deep carbon cycle." Hemley said this basic research could have practical implications in the future. Using laboratory equipment that reproduces pressures deep within the Earth, which are thousands to millions of times higher than on the surface, scientists in these labs have discovered a way to convert carbon dioxide into a rock-like material called polymeric carbon dioxide. With further refinements, scientists could enhance its stability closer to the Earth's surface. The findings also may lead to new materials for commercial and industrial products. Hemley's laboratory, for instance, has developed a way to produce "super" diamonds, or high-quality diamonds that are bigger and better than existing ones. Natural diamonds form slowly under the high-pressure, high-temperature conditions that exist deep within the Earth, while today's synthetic diamonds form under similar conditions in the laboratory. Using a process called chemical vapor deposition, Hemley's research group made diamonds rapidly and at low pressure. The new diamonds have superior qualities, including extreme hardness, improved transparency and better electrical and temperature properties. The diamonds could lead to improved computer chips that run faster and generate less heat than existing silicon chips, Hemley said. They also show promise for use in advanced cutting-tools, more durable and heat-resistant windows for spacecraft and other applications, he noted. The DCO project will probe the big mystery about the formation of natural diamonds, including their chemical composition and how they shoot up quickly from deep within the Earth. Scientists can't directly observe that process at present, as there's no practical way to travel down 100 miles beneath the surface of the planet. Observations are limited to laboratory simulations of this process for now, said Hemley, who is director of the Geophysical Laboratory at the Carnegie Institution of Washington in Washington, D.C. His laboratory specializes in the chemistry and physics of materials under extreme conditions. Hemley's presentation at the ACS meeting, entitled "Chemistry of Planetary Gases, Liquids, and Ices in Extreme Environments," focused on what happens to planetary material under conditions of extreme pressure and temperature, as well as other insights relevant to Earth. Another area that the DCO will explore is energy. The extent to which hydrocarbons in the Earth form from inorganic processes deep within the Earth rather than only from the fossilized remains of plants and animals remains an important unanswered question. Exploring the nature of carbon deep within the Earth may provide clues on how and to what extent this abiotic process might contribute to energy reserves, Hemley said. Finally, DCO research has implications in the search for other life forms on Earth and even outer space. Scientists have already identified microbes at about a mile or so deep within the Earth under high temperatures. They suspect that some forms may exist at even deeper levels. Past studies suggest that bacteria and other life forms can't survive beyond several thousand atmospheres of pressure. But new studies by scientists in Hemley's lab show that some bacteria are capable of surviving pressures of up to 20,000 atmospheres. That supports the theory that life might exist in extreme extraterrestrial environments, Hemley noted. Funding sources for these studies include The Carnegie Institute of Washington, the National Science Foundation, the U.S. Department of Energy, and the Alfred P. Sloan Foundation. There is some interesting hearsay evidence of oil field regeneration in Alaska. Peak oil as a myth used to prop up oil prices? Doubtful, too many players would need to be colluding. Manufactured scarcity is easy in diamond trade due to there being only 2 major players. debeers and Alrosa have gargantuan diamond stockpiles to keep the prices up. synthetic diamond will eventually destroy debeers. it could take hundreds of years. but i like to think that if debeers is capable of destroying science and engineering, then we are headed for the dark ages of human history anyway. if not, then it could be 100 or 200 years but eventually the african slaves used to mine carbon out of the ground will be used for other basic elements, when we finally develop the machinery to turn carbon into diamond, which merely takes the know-how and energy. labor will always be replaced using basic science and technological engineering. it is the way of capitalism. monopolies eventually must adapt to, or get crushed by, technological change. however, it is likely debeers will fight this trend because they may not be able to buy it and control the supply of diamonds with it out in the open. There will always be a market for natural diamonds used in jewelry. Industrial diamond use is already moving toward manufactured diamonds, but that is such a small part of Debeers income to not have much impact. synthetic diamond will eventually destroy debeers. I don't think science and engineering have anything to do with it. Standard economics has nothing to do with it. It's all about societal/cultural forcing. For hundreds of years DeBeers has very carefully crafted a market for themselves and they will continue to craft it so that synthetic diamonds will be pariah. Only considered by the same people who would consider cubic zirconia. My guess is, via DeBeers' "support" of the GIA, they will sully the concept of getting your girl a "fake" diamond. DeBeers will never be "destroyed" by synthetic diamonds until society changes itself. Until society rejects that values that have allowed the crafting of that market in the first place. They claim that synthetic diamonds are superior to natural ones. So when their price can compete with naturals, which one would you choose? The whiter, more perfect synthetic or the not so perfect natural one? Finally, FINALLY some attention is being paid in America to the theory of deep, abiotic petroleum - something the Russians have been chasing for decades (since 1951) with some success. With no contribution of either hydrocarbons or biological detritus, the CaCO3-FeO-H2O system spontaneously generates, at the high pressures predicted theoretically, the suite of hydrocarbons characteristic of natural petroleum. The most surprising thing to me is that this was even allowed to be a topic at the ACS's meeting. Good for them! Earth may have accreted in layers from layers of material across the planetary system.